As someone who considers Donald Trump grotesquely unqualified for the office he’ll soon hold (to the point where fear that he might win drove me to volunteer for Clinton, in spite of my deep-seated apathy and laziness), my one solace over the past few weeks has been reminding myself that politics is cyclical. For every lurch in one direction, you can count on a corresponding shift in the opposite direction, given sufficient time; certain elements of the U.S. election process recur almost like clockwork. 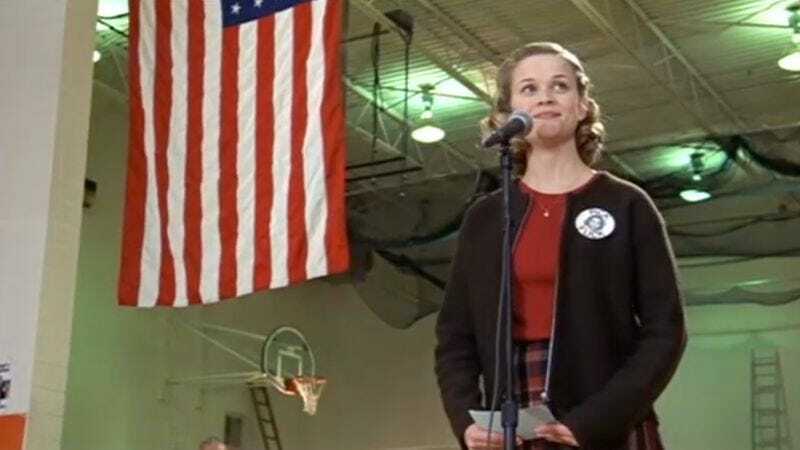 As evidence, I keep thinking of Election, Alexander Payne’s 1999 satire about a hotly contested race for student body president at an Omaha high school. Tom Perrotta, who wrote the source novel (though not the screenplay), was directly inspired by the 1992 election, in which Bill Clinton and George Bush were challenged by the unusually popular third-party candidate H. Ross Perot (who got 19 percent of the vote, versus Gary Johnson’s piddling 3 percent this year). But the movie, at least, arguably bears more similarity to the campaign we just endured, even though only two of its candidates were dominant in the public eye. A quick recap, for those who haven’t seen it (heresy!) or have forgotten the details. Initially, the insanely ambitious Tracy Flick (Reese Witherspoon) is running unopposed for student body president, a job that nobody else particularly wants. History teacher Mr. McAllister (Matthew Broderick), however, finds Tracy insufferable, and is also concerned about the prospect of having to work closely with her (he’s in charge of student government), as she recently had an affair with a fellow teacher who got fired for the offense. Mr. McAllister therefore persuades popular football star Paul Metzler (Chris Klein), who’s broken one of his legs, to run against Tracy, who’s anything but popular. Throwing a wrench into the works is Paul’s sister, Tammy (Jessica Campbell), who’s angry at Paul because he’s started dating a girl Tammy loves, and decides to retaliate by also running for student body president. The three of them make their respective cases at a school-wide assembly in the gym, which does not go precisely as Mr. McAllister and the other adults had planned. Take a look at the clip below, and see whether anything looks vaguely familiar. Election was only Payne’s second feature (following the brilliant, comparatively little-seen Citizen Ruth), and he and regular cowriter Jim Taylor were still very much in take-no-prisoners mode. A search for the word “wheelchair” in Amazon’s listing for the novel suggests that the screenwriters invented that detail for the student who’s running unopposed for vice-president. That he has no competition serves as a reminder that two of the three presidential candidates wouldn’t be running had Mr. McAllister not interfered with the process. (Later, Mr. McAllister will secretly discard two key votes—a development that obviously has far more relevance to 2016 than to the ’92 campaign, in which nobody was tweeting “Media rigging election!” on a daily basis.) And while the movie doesn’t exactly poke fun at the kid for being handicapped (his lame joke even gets a decent laugh from the crowd), it does implicitly suggest that, apart from a maniacal personality like Tracy, only a student physically incapable of taking part in many other extracurricular activities would show any interest in student government. Even Paul agrees to run solely because he can’t play football at the moment, and is open to Mr. McAllister’s plea that he channel his school spirit in an alternate direction. Election isn’t mean enough to equate a student using a wheelchair with pathetic—it’s the idea of student government that’s the target, not the student—but it’s almost that mean. Neither of the other two candidates makes for a ready match with Trump, but aspects of Trump’s, shall we say, unique candidacy can be found in both. Paul’s cluelessness elsewhere in the movie made me first think of Gary Johnson asking what Aleppo is, or being unable to name a single world leader he admires. And there’s certainly zero correspondence between Paul’s rushed, monotone delivery of his speech (Klein does an amazing job of replicating the choppy cadence of someone reading text without processing what it says) and Trump’s largely extemporaneous, supremely confident rhetoric. Note, however, that Paul’s mumbling sales pitch involves reminding the school of his past glory as a football player, even though throwing a winning touchdown in no way qualifies him to govern. Undaunted by this obvious fact, he uses a series of sports metaphors that aren’t far removed from “I have made billions of dollars in business making deals—now I’m going to make our country rich again.” Between Paul’s horrible delivery and his false equivalence, his speech goes over so poorly that Mr. McAllister has to get the applause started for him, even though he’s one of the most popular kids in school. He’s clearly out of his depth. And then there’s Tammy, the ultimate bomb-throwing outsider. Perot was the inspiration for her character, but for all his folksy kookiness, he was a model of statesmanship compared to Trump. Tammy’s message of extreme apathy would only work in a high school context—nobody could possibly win the U.S. presidency with the slogan “Who cares?”—but her willingness to ignore virtually every unwritten rule of campaigning, and the appeal of such recklessness and destructive honesty to people who are weary of business as usual… well, we’ve now seen that it doesn’t always get you suspended (Tammy’s fate). When Tammy vows to dismantle the student government entirely, it occurred to me, for the first time, to look and see how Tracy reacts. Sure enough, not only does she look aghast (Clinton, after Trump’s refusal to affirm that he’d accept the results of the election: “Well, Chris, let me respond to that because that’s horrifying”), but she actually turns to where Mr. McAllister and the other faculty members are standing, though they’re not visible in the frame. It’s as if she wants to ask, “Is she allowed to say that? Aren’t you going to do something?” That helplessness in the face of outright insurrection of the process was funny in 1999, because the whole situation was ridiculously over the top, with no analogue in the ’92 campaign. It’s not nearly as hilarious today.